Ma Cipriani comparing her son Toni to delicatessen owner and Leone Family associate Giovanni Casa. Get good photographic evidence of Giovanni Casa's pervertedness. 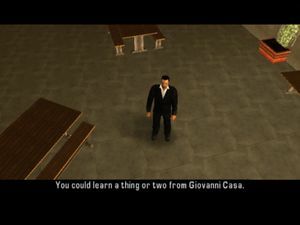 Snappy Dresser is a mission in Grand Theft Auto: Liberty City Stories given to protagonist Toni Cipriani by his mother at his mother's restaurant in Saint Mark's, Portland, Liberty City. The mission begins with Ma Cipriani complaining to Toni that he never called and comparing him to Giovanni Casa, a delicatessen owner in Chinatown. Toni decides to prove to his mother how perverted Casa is and goes to his apartment in Saint Marks to pick up his camera. Toni drives to Casa's deli and sees him pick up two prostitutes (one called Mona Lott), and follows them as Casa drives to a secluded area at Callahan Point. Casa then changes into a diaper and begins to chase the startled prostitutes. Toni takes a picture of Casa, who realizes someone is watching and makes a quick escape. Toni goes to his mothers restaurant with photographic evidence of Casa's pervertedness and hoping to gain some approval from his mother. However, Toni is once again attacked, with his mother still admitting that Casa is a good man, and a better man than Toni. Toni Cipriani: Ma? It's me! I'm back! Ma Cipriani: Toni? ... Where the hell have you been? Not one phone call all the time you were away! They don't have phones where you were? Toni Cipriani: Aw! Come on Ma! You know I couldn't call! Ma Cipriani: A real man would have called his mother. You could learn a thing or two from Giovanni Casa. He calls his mother every day. Now, he's a good man. And his Sicilian sausage is the best in town! Toni Cipriani: Casa! But Ma, Casa ain't no good man. He's a pervert! Ma Cipriani: That's just a foul mouthed rumor! What kind of a man are you, Toni? Toni Cipriani: Alright Ma, whatever you say. Toni Cipriani: Maybe I'll give Giovanni a call... see what he's up to. (Toni drives to Giovanni's deli). Giovanni Casa: I think I'm in the mood for some luvin'. (Toni follows Giovanni until he picks up two prostitutes and then drives to Callahan Point). Giovanni Casa: Ok ladies. Give me a minute here will ya. I'm gonna change in too something that's a little more... me. (Giovanni changes into a diaper and exits the back of his van). Giovanni Casa: Okay ladies! It's milk time! Who's gonna be momma? Giovanni Casa: Aw, come on girls! Get with the program! (The two prostitutes begin to run in circles and away from Giovanni, whilst Toni takes a photo to Giovanni in a diaper). Giovanni Casa: Oh God! Oh God! DON'T - LOOK - AT - ME. (Toni drives back to his mothers restaurant with the photographic evidence). Toni Cipriani: Hey Ma! Take a look at my photo! It's your 'good man' Giovanni Casa... wearing a goddamn diaper! Ma Cipriani: Is this how you spend your time? Sneaking in the woods taking pictures of men? What's wrong with you Antonio? You shame me! Ma Cipriani: And, diaper or no diaper, he's still a better man than you! The reward for passing the mission is $100 and unlocks the next mission from Ma Cipriani, Big Rumble in Little China. Toni Cipriani collecting his camera from his apartment. Toni Cipriani driving to a location close to Giovanni Casa's delicatessen. Toni Cipriani following Giovanni Casa in his van. Two prostitutes, including Mona Lott, entering Giovanni Casa's van in Chinatown. Toni Cipriani getting too close to Giovanni Casa in his van. Giovanni Casa in his baby outfit. Toni Cipriani taking a photograph of Giovanni Casa, Mona Lott, and the un-named prostitute. Toni Cipriani driving back to his mothers restaurant. Toni Cipriani talking to his mother about Giovanni Casa's secret. Martha's Mug Shot, a similar mission in GTA Vice City that also involves taking pictures of a target. This page was last modified on 8 May 2015, at 23:24.